The Spanish House is a hotch potch of designs, Georgian, Gothic and Moorish, as if whoever started it had simply got bored. It has long been known to locals as an architectural folly, and is now nearly derelict to boot. When its reclusive owner dies intestate the Spanish House is left to his city-dwelling niece. For Isabel, recently widowed, the house is a potential lifeline - the only hope she has of providing for her two children without having to sell her most treasured possession. But for neighbour Matt McCarthy, the house is revenge - on the family who ruined his father. For his wife it's the key to the perfect family life, while a struggling property developer sees in it a whole new future. As desires clash and intertwine, lives and loves are demolished - and the Spanish House becomes a true folly indeed . 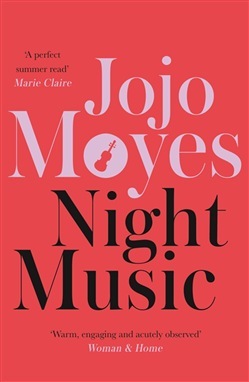 . .
Acquista Night Music in Epub: dopo aver letto l’ebook Night Music di Jojo Moyes ti invitiamo a lasciarci una Recensione qui sotto: sarà utile agli utenti che non abbiano ancora letto questo libro e che vogliano avere delle opinioni altrui. L’opinione su di un libro è molto soggettiva e per questo leggere eventuali recensioni negative non ci dovrà frenare dall’acquisto, anzi dovrà spingerci ad acquistare il libro in fretta per poter dire la nostra ed eventualmente smentire quanto commentato da altri, contribuendo ad arricchire più possibile i commenti e dare sempre più spunti di confronto al pubblico online.